Sandwich Labelling Solution - we made a video to explain it all! Positive ID Labels offer a complete sandwich labelling solution for customers. The solution is easy to use and execute but we felt that the sales page was rather stale and didn’t convey just how effective the system was. In order to improve the interaction our customers have with our sales pages, we chose to do a short video that pretty emphasises the main benefits of our sandwich label system. To that end, we have loaded the following video to our site. Positive ID Labels offer service unlike any of our competitors. We can configure your system for you before you receive it and can provide ongoing remote desktop support. As a special offer, Positive ID Labels also offer to provide the hardware and software free to any customer ordering 100,000 labels from us. 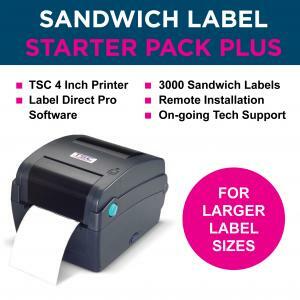 The sandwich labelling solution uses a thermal printer supplied by us. We also provide specialised labelling software, ideally suited to sandwich labelling requirements. You then complete a table on a spreadsheet with the variable data; this is far simpler than it sounds. Ingredients – e.g. the ingredients you use to make the sandwich. Price – e.g. £2.00 – whatever you sell the product for. In the label software, you position boxes where each bit of information will be printed and link the boxes to the database – a box at the top for the title, a box in the middle for the ingredients etc. It really is simple to do. Once this is complete, you can print any type of sandwich that you have entered into your database. The software can resize the text to fill the box completely so you don’t have to do any further editing. You can add or change any bit of information by changing the contents of your database – for example changing prices or altering ingredients. It really is very easy to create hundreds of labels in very short order.